Two iPhones stolen in separate incidents, elder abuse of a centenarian, and just a lot of physical violence this week, according to the crime reports. 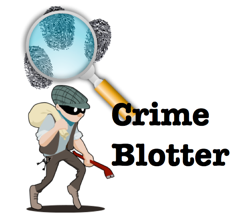 Crime blotter provided by the Altadena Sheriff Station. 12:35 AM – Suspect Ricardo Valdez (male/22, Pasadena) was arrested by deputies at Lake Avenue/Loma Alta Dr. for public intoxication. Between 6:00 AM and 7:00 PM – A residential burglary occurred in the 1000 block of E. Woodbury Road. Loss: laptop and jewelry box. Between 5:30 PM and 5:45 PM – A petty theft occurred at Verizon Wireless, 2230 Lincoln Avenue. Loss: black iPhone. 8:00 AM – Deputies arrested a suspect (female/ 60 years old, Altadena) in the 100 block of Las Flores for physical elder abuse. The suspect/caregiver physically assaulted a 101 year old woman. 4:02 PM – Suspect unknown stole an iPhone from the Verizon Store at 2230 Lincoln Avenue. 2:40 PM – Deputies arrested a suspect (male/32 years old, Altadena) at LincolnAvenue/Acacia St. for physical elder abuse. The suspect physically assaulted his 69 year old mother. Between 11:00 PM and 7:49 PM (Thursday) – A petty theft from an unlocked vehicle occurred in the 2200 block of Brambling Lane. Loss: coins. 6:58 PM – Suspect Jessie Warren (male/59 years old, Los Angeles) was arrested at Fair Oaks Avenue/Harriet Street for public intoxication and drinking in public. 10:00 AM – Deputies arrested a suspect (male/43, Altadena) in the 2200 block of El Sereno Avenue. for domestic assault and criminal threats. 2:15 PM – A juvenile suspect (16 years old) was arrested at a group home in the 2900 block of El Nido Drive for punching another resident at the location. 3:57 PM – Deputies arrested a suspect (male/66, Altadena) in the 2100 block of Crawford Avenue, for domestic assault. 6:54 PM – Deputies arrested Steven Hopkins (56 years old) in the 2500 block of Fair Oaks Avenue, for possession of controlled substance and possession of drug paraphernalia. 5:47 PM – Deputies arrested suspect Victor Crawford (48 years old, Pasadena) at Glenrose/Laun St., for possession of a controlled substance. 5:40 PM – A motorcycle was reported stolen in the 2200 block of Washington Boulevard. (recovered at 6:00 PM in Azusa). Between 9:15 PM and 10:00 PM – A residential burglary occurred in the 1500 block of New York Dr. Loss: computer. 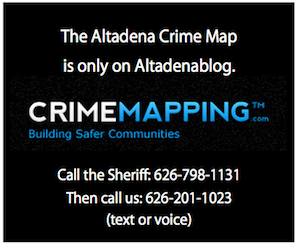 Between June 29 and July 6 there were 12 runaway juveniles reported to the Altadena Sheriff Station.